Our travel recently has been a bit hectic and May has seen us spend two lovely weekends in two very different places. First of all we spent a few days in Northern Ireland catching up with family and friends. Some time too for touring around and just a few hours to create two watercolours. Firstly we visited a very nice Farm shop and cafe in Hollywood called McKees, and from there we had a lovely view of Scrabo Tower and the Mourne mountains. I could not resist trying to reproduce the scene in this watercolour. 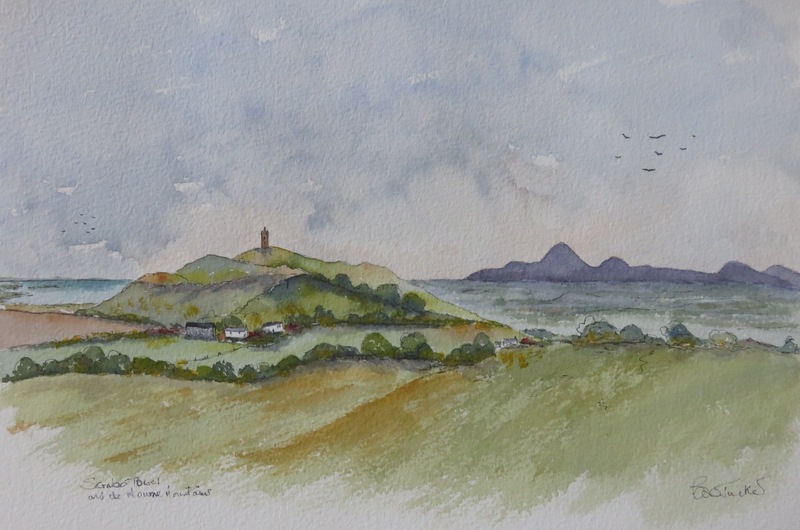 Scrabo Tower and the Mourne Mountains. Another day saw us travelling to Newcastle, right next door to the Mourne Mountains. Just north of Newcastle is Murlough Bay and in this nature reserve there are lovely walks that take you down to the sea. 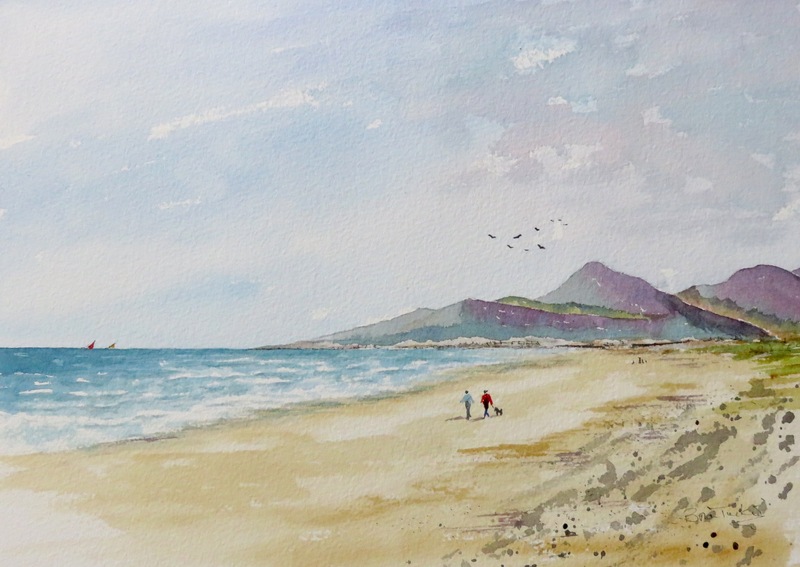 This watercolour is that view, the beach and the Mourne mountains sweeping down to the sea. The Mourne Mountains from Murlough Bay. With many more photos taken over the weekend I now have lots of ideas for more paintings, and an update to my Ulster guide book. Just one week later we were off to the coast of Normandy in France with some friends. Our main aim was to view the Landing Beaches, Museums and Cemetries associated with the Normandy landings of June 1944. The invasion of France in 1944 heralded the final winning phase of the war in Europe which ended 70 years ago. The sacrifice and endeavour of the brave soldiers, sailors and airman can be felt as you walk and visit the sights in this area. We managed to see a lot in a few days and enjoyed Normandy, it’s people, food, cider and scenery. So just two watercolours so far but more to follow as we managed a visit to Honfleur as we travelled back to Calais and the Channel Tunnel. 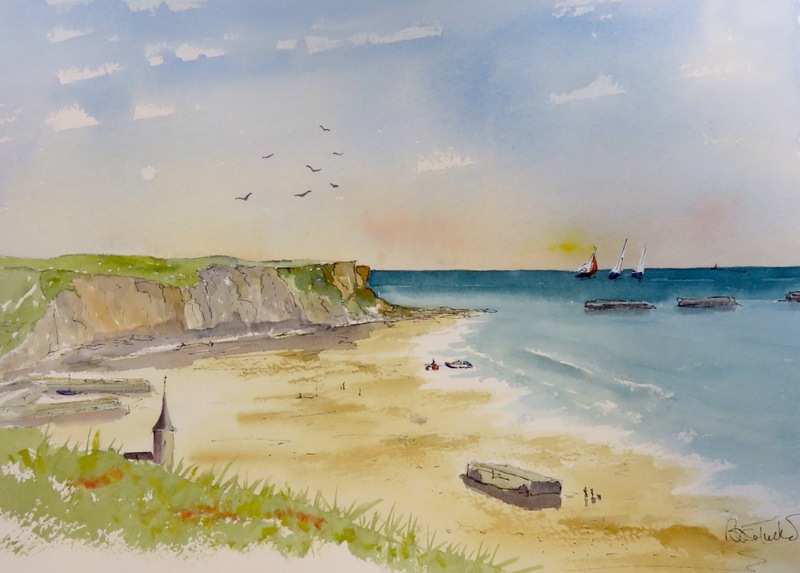 From the beach at Arromanches you can still see the mannificent artifical harbour created in June 1944 and some of these colosal structures are shown in the painting. Inland just a few miles away is Bayeux, famous for the Tapestry but a really lovely town with a wonderful Cathedral. The Mill Wheel in Bayeaux. Watercolour 14 inches by 12. 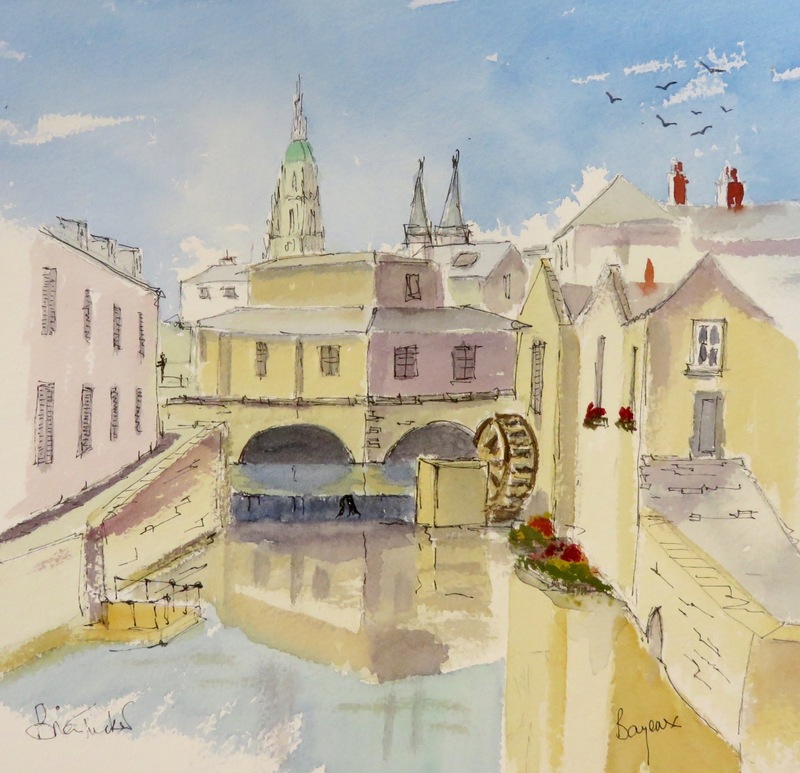 This mill wheel and the river are in the heart of Bayeux with a view across to the Cathedral. If you ever can, do visit Normandy and the landing beaches. They are amazing memories of a crucial time in the ending of World War 2.